"The first-ever Chicago Architecture Biennial was an unequivocal success, exceeding our expectations for attendance and bolstered Chicago's reputation as the vanguard of architectural thinking on the national and international stage," said Mayor Rahm Emanuel. An outgrowth of the city's Cultural Plan, the city created the biennial to showcase Chicago's legacy as a birthplace of modern architecture and reassert its centrality to global architectural discourse. "The City of Chicago is synonymous with architectural innovation, from the world's first modern skyscrapers to the forefront of urban design, which is why Chicago was naturally suited to host an architectural event of this scale," Emanuel added. The city reiterated its commitment to producing another biennial in 2017, and will announce dates, partners, and organisers in the coming months. The 2015 event was co-curated by Sarah Herda, executive director of the Graham Foundation, and Joseph Grima, the former editor of Domus, with an advisory board comprised of David Adjaye, Wiel Arets, Elizabeth Diller, Jeanne Gang, Frank Gehry, Sylvia Lavin, Hans Ulrich Obrist, Peter Palumbo, Zoë Ryan, and Stanley Tigerman. Writing in Dezeen, Sam Jacob hailed the biennial as being "rooted in the visionary, imaginative tradition (rather than history) of Chicago itself." The sprawling exhibition including a number of proposals related to housing, including prototypes for low-cost homes by Tatiana Bilbao and Vo Trong Nghia and a house made of corridors by MOS. Sou Foujimoto made architecture out of household items including pingpong balls and potato chips, while Swiss and American students used robots to create a monumental sculpture made of rocks and string. 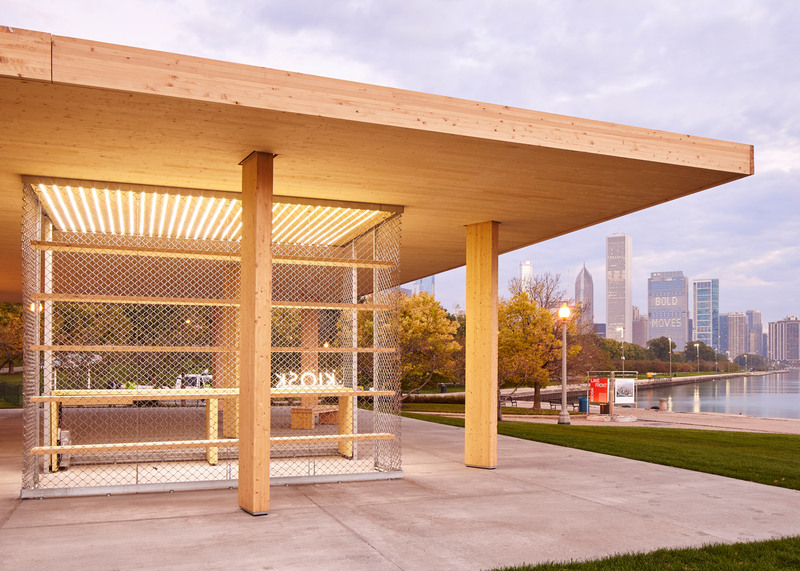 The organisers of the event also sponsored an international competition for three new lakefront kiosks, the largest of which was a timber structure by Ultramoderne with a large flat roof and a small viewing platform. The Stony Island Arts Bank, a cultural centre and archive featuring a library and the record collection of DJ Frankie Knuckles, opened during the show. The institution was created by the artist, urban designer, and developer Theaster Gates and is located on the city's South Side.